In recent years efforts have been made to improve the acoustics in the chapel by introducing new, state of the art systems. Apart from regular services including choral music, the chapel holds numerous concerts and lectures throughout the year. It is important therefore that the acoustic properties are to a high standard. It would seem that it was a recurring problem for large churches and cathedrals, as they installed sounding boards over the pulpit in order to capture the voice of the preacher and so containing the spoken word within the area that the congregation were gathered. More modern methods of electric amplifiers and microphones have replaced the need for sounding boards. During the Middle Ages this problem was duly considered and steps were taken during the building of churches to improve the acoustics of ecclesiastical buildings where singing was an important part of daily life. Whilst it has been noted that round red earthenware pots have been found built into the existing east wall face of some churches, there is not a great deal of evidence existing to suggest that these were a generally accepted device. Pots have not survived in any great numbers; however they may have been damaged or removed during the remodelling or conservation works. The discovery in 1953 of acoustic pots under the floor boards in the quire of St George’s Chapel raises yet another method of improving the acoustics. The two pots were both found on the south side of the quire. The first one lying with its open mouth facing south under the Minor Canon’s stall, the second pot was mortared into position below the joist with its open mouth facing north. The construction of St George’s Chapel chancel is more elaborate than a parish church. Pots built into the eastern walls would not necessarily have aided the acoustics in the quire. We cannot therefore be sure that the pots found under the thick floorboards would have had the desired effect. 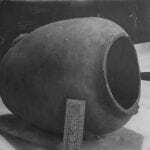 The largest of the pots measuring fifteen and half inches tall and made of a quite fine red pottery was complete apart from the handle being broken off and a piece out of the neck. The smaller pot more clearly ribbed with a slightly decorated base rim measured eleven inches with some of the top broken off. The pots were dated to a fifteenth-sixteenth century type, with rounded bases and may have been made for standing in a rack to hold liquid. If they were discarded by the workmen why was one mortared into position and the other placed on a joist cut to fit around the pot. They were of great archaeological interest at the time as each pot contained a variety of objects. Animal bones, a nut, an oyster, snail shells, wood shavings and dried up flower heads. Examination of the bones by Dr. W E Swinton of the Natural History Museum dated most of them to be of modern generation, whereas others were possibly left by the original workmen. 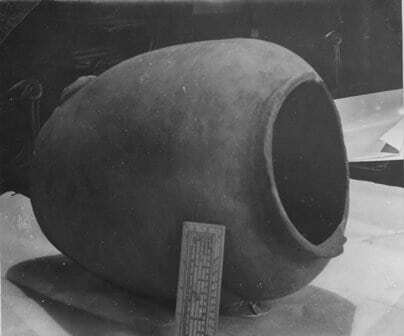 Were the contents placed in the pots with the idea that they would further improve the acoustics properties or were they introduced by unwanted small animals?